Thank you for visiting the Color Master Collision Center website! Our expert auto repair team has provided high quality paint, body and collision repair services to the Mooresville area for over 19 years. We are the Premier Paint & Body Shop in Mooresville. Get a FREE Estimate for any major or minor auto body repair with a quick call to our owner Pat Bradshaw. We repair all makes and models of cars, trucks and vans, domestic and import. We have an outstanding reputation for working well with all insurance companies from our top quality work that is backed by our Color Master guarantee. From the frame to the finish, we get it right the first time without any issues. We will provide you with an estimate or will accept your insurance adjusters estimate. Rental cars and tow truck services are available as well, we can arrange to have you picked up and returned to Color Master when your car is ready. All projects come with an estimated completion date to get your car back behind the wheel as quickly as possible. 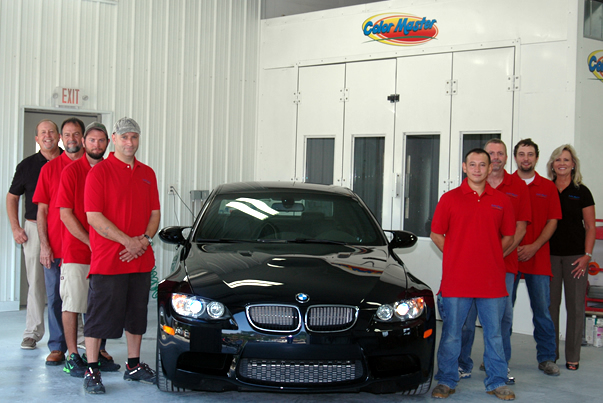 Get your car fixed by the professionals at Color Master!